AC/DC must have begun to think that someone had a thing against them. In the last two years, the most enduring of the hard-rock bands has been plagued by a catalogue of misfortune. First, Malcom Young, their founding guitarist had to step down from the band because of dementia. Then, a haze of criminal charges on Phil Rudd led to his departure. Most recently, the risk of total hearing loss meant that their singer Brian Johnson had to stop touring. The fans are definitely not pleased with any of this and they were also unsatisfied by his replacement; Axl Rose. 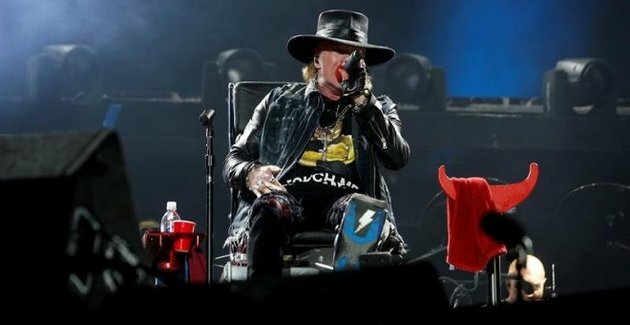 He is the singer of Guns N’ Roses, which has reunited recently, and suffered some adversity due to a fractured foot. But, essentially, he just didn’t come off as AC/DC material. A hat is jammed onto his head at all times similar to Johnson and this is where the similarities were expected to conclude. However, it seems that Rose is actually pleased with being able to play a different role with AC/DC. He came off as a pleasant and differential presence in between songs, but a brooding and energized one during them. Since his leg was in a brace, he remained seated, but his seat seemed quite low-key. Nonetheless, even if his body was not 100%, his voice was undoubtedly in excellent shape. From the opening set of ‘Hell Ain’t a Bad Place to Be’, ‘Shoot to Thrill’ and ‘Rock or Bust’, it was quite clear that the singer was more than suited to AC/DC musically. Sure, he missed a few cues and was a bit unsure on more recent material, but he performed quite well and got along with the guitarists Angus and Stevie Young, drummer Chris Slade and bassist Cliff Williams. The Bon-Scott era classics like High Voltage and Dirty Deeds Done Dirt Cheap were where Rose felt most comfortable and seemed happy to defer to the all-action, duck-walking showmanship of Angus Young. Things might change a bit once the singer becomes mobile again and is able to walk, but for now Rose was satisfied with the dynamic as he enjoyed himself while Young dealt with the heavy lifting. He had some fun by stating that the song Shot Down in Flames was based on his life story, changed lyrics of some songs and also gawped at the band’s unimaginative and enduring props. The main set was able to win over the crowd and all doubts about Axl fitting in were eliminated. If some were still unconvinced, the final volley was able to clear any doubts as there were resounding cheers from the crowd when Rose walked onstage to say goodbye. Hence, this particular mash-up of classic rock bands was able to prevent itself from becoming the Batman Vs. Superman of hard rock, which means that it wasn’t flashy, loud yet empty. Instead, Lisbon’s performance gave us a look at what could be one of the touring hits of the summer as long as any future mishaps are avoided by Rose and AC/DC.